Enter your text here...Home automation is a phrase that’s on everybody’s lips these days and there are more than a few ways to make your home smarter and more efficient. One of the best ways to start automating your home is to get a smart weather station. Smart weather stations are versatile devices that can bring more to your home than just accurate weather readings. You can connect them to other smart devices at home, such as smart thermostats and sprinkler systems. But there is always the question of how to choose the best weather station for home automation. To help you make an educated decision, I’ve selected some of the best smart weather stations that can make your home more automated. 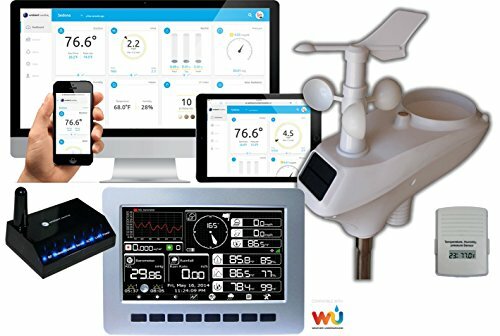 What Is a Weather Station for Home Automation? In a nutshell, a weather station for home automation can go online and has the capacity to connect to other gadgets in a smart home. These stations pair with other smart devices and gadgets to create a unique home ecosystem. When it comes to measuring capabilities, home automation weather stations are usually on par with generic weather stations. These devices measure indoor and outdoor temperatures and precipitation and humidity levels, and some can even read air pollution in the area. 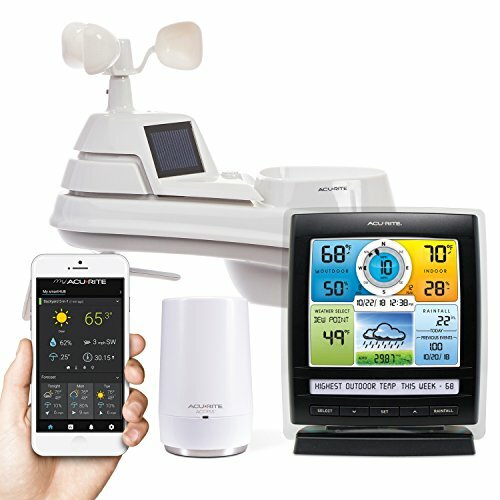 What to Consider When Buying a Weather Station for Home Automation? To ensure your home is as smart and as automated as it can be, take a look at some of the key features. All smart-home owners want to stay on top of what’s going on in and around their property even if they are far away. This is particularly important if you live in an area that is prone to sudden extreme weather changes. A weather station with customizable alerts allows you to react instantly. As soon as the system spots unfavorable weather change, you will get a notification on your smart device. What I particularly like about smart weather stations is the voice control system integration. In other words, you can achieve the ultimate home automation by connecting your weather station to personal assistants like Amazon Alexa and Google’s Assistant. This way you are always just a voice command away from controlling all of the smart aspects of your home. If your goal is to design a truly automated home then you should invest in a weather station that has the capability to share information remotely. For example, you might consider a service like IFTTT that would enable the weather station to communicate with other devices in your smart home. The Netatmo has quickly become one of the most highly sought after weather stations for home automation for good reason. 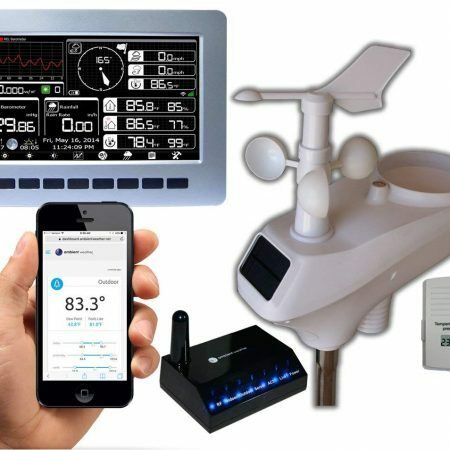 This weather station comes with a set of premium aluminum sensors and a user-friendly app to monitor all of the weather parameters. To ensure smart home connectivity, this weather station is also Amazon Alexa-compatible. The software features a weekly forecast so the users can stay on top of their outdoor activities. There is an option to go back and analyze past weather conditions. In keeping with the spirit of home automation, this weather station allows you to customize notifications and weather alerts in real time. I am particularly fond of the ventilation alert which notifies when it is time to air out your home. 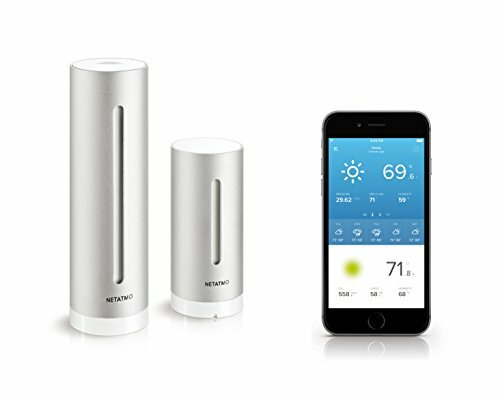 The Netatmo weather station keeps track of outdoor and indoor temperatures, barometric pressure, and humidity. What sets it apart from the competition is its ability to measure indoor noise level and air quality. On top of that, the unit is reasonably priced and you have the option to purchase the optional rain gauge, wind gauge, or an additional indoor module. Like all desirable weather stations for home automation, the AcuRite 01012M is Alexa-compatible. For example, to get the current weather status in your backyard, all you need to do is ask Alexa about it, and the personalized weather notifications ensure the best user experience and keep you on top of what’s going on outside. However, that’s not the end of this unit’s connectivity options. You can connect it to portals like Weather Underground where users can share the weather with the rest of the community. The 01012M also comes with the AcuRite access point which supports up to seven compatible devices to create a truly automated home system. The AcuRite 01012M gives accurate readings of wind speed and direction, temperature, rainfall, and barometric pressure. All of the readings are kept for a month in 5-minute increments to ease weather analysis and trend spotting. This AcuRite model also logs all of the weather conditions for 12 hours in case of a power outage, which is a great feature in my book. No matter which way you look at it, the Ambient Weather WS-1201-IP is the best weather station for home automation. The unit comes with so many bells and whistles that it could justify an entire write-up. I will try to outline some of its best features in just a few words. The WS-1201-IP is a solar-powered weather station that combines wireless technology, accurate sensors, and user-friendly installation. The all-in-one sensing unit transmits all of the data to the display console via the Observer IP module. If this sounds like something you could find on the Starship Enterprise, you are not far off. However, despite the spaceship-like properties, the WS-1201-IP user interface is really easy to read and navigate. It shows outdoor and indoor temperatures, wind speed and direction, humidity, and rainfall. But that’s not all; the device is also capable of measuring solar radiation and UV index. If the display console is too much for you, there is no need to bother with it. This device connects to Ambient Weather Network and Alexa, and works well with IFTTT to offer the comfort of smart device controls. Getting a smart weather station will bring you one step closer in your pursuit for home automation. And since you will probably be building a system for years to come, it may be worth it to invest in a top-of-the-line model. The best weather station for home automation is the Ambient Weather WS-1201-IP. Its sensing capabilities awe-inspiring and it features a host of connectivity option so that you can easily set up the entire system on your own.